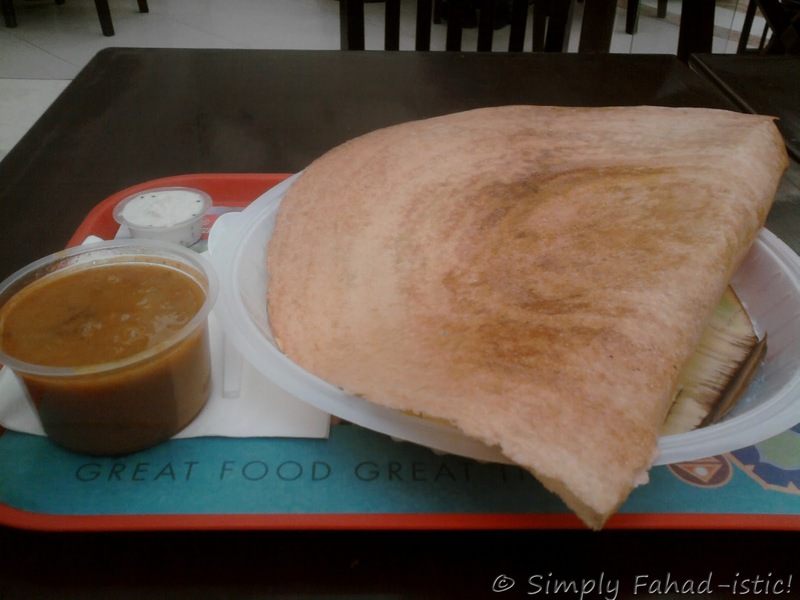 A Taste Of South India: Masala Dosa - Simply Fahad-istic! Dosa served on a plantain leaf lined plate,with an array of chutneys and sambhar. 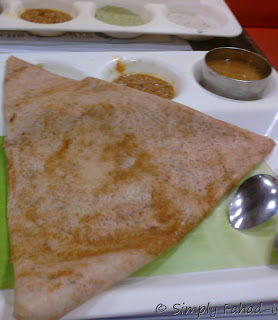 One of the most amazing dishes that embodies both taste and presentation of southern India is Masala Dosa.These thin,crisp and golden rice crepes are stuffed with a tasty mildly-spiced potato mash.Not only delicious on their own,they are a stunning full meal if served with a refreshing coconut chutney or piping hot sambhar,when friends arrive. Grind all the rice in a blender with some of the water it was soaked in to a smooth,fine paste.Do not discard leftover water.Repeat the process with white lentils.Then,mix both the pastes together along with salt in a large container since this batter will rise during fermentation.If the batter appears to be too thick,dilute it with the remaining rice/lentil water.Rest it for four to six hours at a warm place in your kitchen. For the filling,deep fry cashewnuts in hot oil over a medium flame till golden brown and gorgeous.Keep aside. Now,start with heating the ghee in a kadhai.When hot,tip in the mustard seeds.As they splutter,add the bengal gram and saute till it is light brown and fragrant.Stir in the onions along with green chili next.Onions will give a subtle sweetness in terms of taste,a bite and crunch in terms of texture.Cook them until they become transparent and add the ginger and curry leaves.Give a good stir,put the mashed potatoes along with turmeric powder.Adjust the salt,remembering that the potatoes have been boiled in salted water.Let the potatoes heat through for three-four minutes.Finish the filling with cashewnuts,lemon juice and cilantro. To make dosas,warm a dosa tawa/griddle on low heat.Drop a ladleful of the snowy white,fermented batter in the centre,and rapidly move the ladle outwards in circular motion,making a thin crepe.Let it cook for thirty seconds.Drizzle one tablespoon of ghee or so,on and around this crepe,and continue cooking till the side on the griddle turns golden brown.Place one-third of the filling on one half of the dosa,and fold the other half over.Repeat to make two more dosas.Serve with coconut chutney and sambhar,the delicious Indian lentil and vegetable stew as a main meal,or just by itself at tea time! 1. Parboiled rice is easily available at supermarkets and stores.You are not required to half cook/parboil the rice,as the name suggests. 2. The water used to soak rice and lentils is reserved for making paste rather than fresh water,since it aids fermentation. 3. Temperature of dosa tawa/griddle is of prime importance.It needs to be warm as spreading the batter on a hot tawa is very difficult.As the temperature of tawa becomes quite high after making a dosa,from the next time some cold water should be sprinkled on it to cool it down. 4. Dosa is to be cooked only on one side. Omit the potato filling to make plain dosa. Five star hotel restaurants,nukkad eatries,mall food courts,office canteens,roadside kiosks,every place seems to be doing dosas. This post reminds me of my days at Saravana Bhawan in Cannaught place. The dosa looks fantastic! What a nice, crispy dosa. That's what I call comfort food. Love masala dosa any time of the day -- breakfast, lunch or dinner. Yum! My all time fav south Indian food with some hot rasam :) Now that I learned how to make it at home .. i love it all the more.